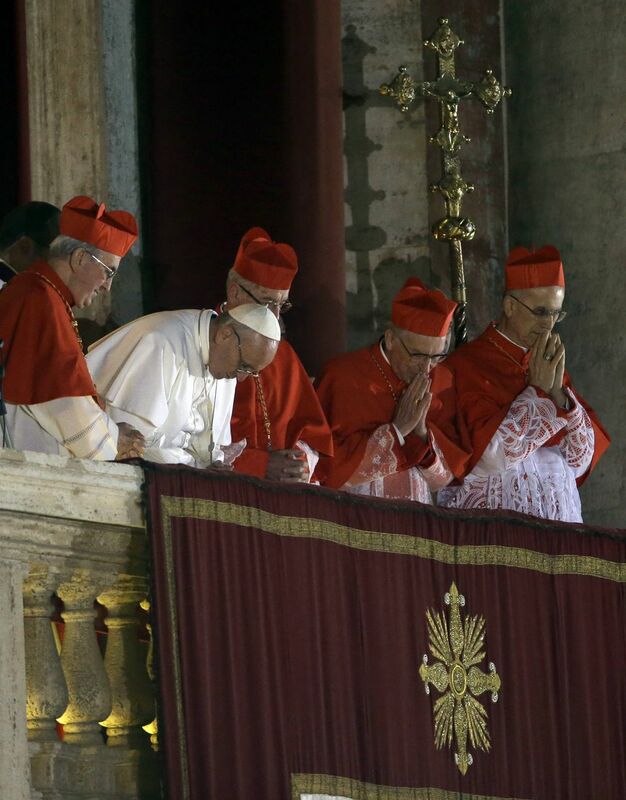 Pope Francis bows as the people pray for him. O Lord, we are the millions of believers, humbly kneeling at Thy feet and begging Thee to preserve, defend and save the Sovereign Pontiff for many years. He is the Father of the great fellowship of souls and our Father as well. On this day, as on every other day, he is praying for us also, and is offering unto Thee with holy fervor the sacred Victim of love and peace. Wherefore, O Lord, turn Thyself toward us with eyes of pity; for we are now, as it were, forgetful of ourselves, and are praying above all for him. Do Thou unite our prayers with his and receive them into the bosom of Thine infinite mercy, as a sweet savor of active and fruitful charity, whereby the children are united in the Church to their Father. All that he asks of Thee this day, we too ask it of Thee in unison with him. Whether he weeps or rejoices, whether he hopes or offers himself as a victim of charity for his people, we desire to be united with him; nay more, we desire that the cry of our hearts should be made one with his. Of Thy great mercy grant, O Lord, that not one of us may befar from his mind and his heart in the hour that he prays and offers unto Thee the Sacrifice of Thy blessed Son. At the moment when our venerable High Priest, holding in His hands the very Body of Jesus Christ, shall say to the people over the Chalice of benediction these words: “The peace of the Lord be with you always,” grant, O Lord, that Thy sweet peace may come down upon our hearts and upon all the nations with new and manifest power. Amen. I just love Pope Francis, because the first thing he did at the balcony was humble himself and ask the flock for prayer. I’m excited to see what he’ll do for the Church! Thank you for sharing this beautiful prayer! Prayed it, love it, shared it! Thank YOU very much for YOUR post. I woke to pray by this post. Thank you for Your prayer for Pope Francis. I decided to pray for Pope Francis. Thank YOU very much.